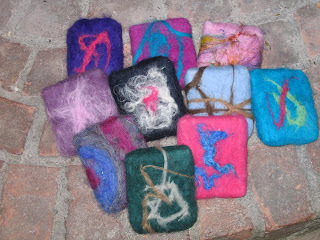 Here are some felted soaps made at the farm. They are 2 ounce bars that are wraped in dyed sheep wool, then plunged into warm soapy water, then rubbed on a bumpy surface. This process shrinks and when it's dried allows the wool to shrink around the bar, now you have a built in wash cloth. The wool and the soap act together creating a wonderful bathing experience. The bars in this picture are patchouli, but we have them in our farm stand in numerous scents and styles.